Today marks the 10th anniversary of the Indian Ocean Tsunami that happened on December 26, 2004 and devastated Indonesia, Thailand, Sri Lanka, India and other countries around the Pacific Rim as one of worst natural disasters in modern history. Banda Aceh in Indonesia's Aceh province was among the hardest hit areas. More than 160,000 people died in Indonesia, accounting for more than 50% of the total 230,000 victims killed from all affected countries. Indonesia's Vice President Jusuf Kalla attended a ceremony in Banda Aceh today where many ambassadors of countries that assisted in the massive recovery effort 10 years ago were also present. The stamped card was purchased at the Banda Aceh Post Office in early 2005 when I was volunteering in the recover effort. 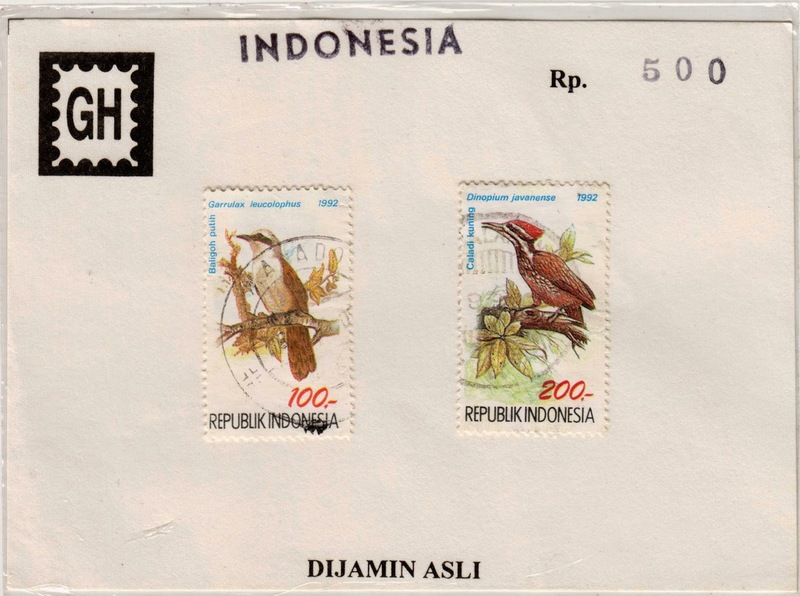 It has two of the four birds stamps issued on January 7, 1992: a 100 Rp White-crested Laughingthrush (Garrulax leucolophus) and a 200 Rp. Common Flameback (Dinopium javanense) with a remark "Dijamin Asli" (guaranteed authentic) on the bottom of the card.